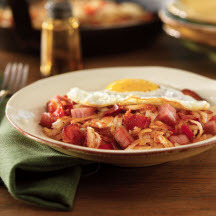 Comfort food personified, this hash is a winning breakfast or brunch dish, but makes for a good supper, too. It will be more satisfying if served with freshly baked biscuits (mix them quickly from a mix as a time saver) and your favorite jam. A seasonal fruit salad would be perfect served alongside, or perhaps a green salad with apple slices, shredded Cheddar, and toasted walnuts. Try also topping the hash with a fried egg. Cook bacon in large (12-inch) skillet over medium heat, turning once, until crisp and browned, about 8 minutes. Transfer bacon to paper towels to cool. Pour fat from skillet into small bowl. You should have 5 tablespoons; add vegetable oil, if needed. Return 3 tablespoons bacon fat to skillet over medium heat. Add ham and cook, stirring occasionally, until beginning to brown, about 2 minutes. Add onion and red pepper and cook, stirring occasionally, until onion is golden, about 7 minutes. Add hash browns and cook until underside is mostly golden brown, about 7 minutes. Drizzle remaining 2 tablespoons bacon fat over potatoes. Using metal spatula, turn hash browns over in sections. Continue cooking until other side is mostly golden brown, about 7 minutes. Continue cooking, stirring occasionally, until hash is completely golden brown, about 5 minutes more. Sprinkle with crumbled bacon and season with salt and pepper. Serve hot. If desired, top each serving with a fried or poached egg. Nutritional Information Per Serving (1/6 of recipe): Calories: 180 calories; Protein: 12 grams; Fat: 6 grams; Sodium: 650 milligrams; Cholesterol: 25 milligrams; Saturated Fat: 1 grams; Carbohydrates: 21 grams; Fiber: 2 grams.